Yet another strawberry garden in Cameron, this one promises to be as tasty as it can be. Manged by the local Malay farmers, the YZ strawberry farm offers you a sumptuous day out with family and kids. A tour to this farm will let you learn how strawberries are grown. 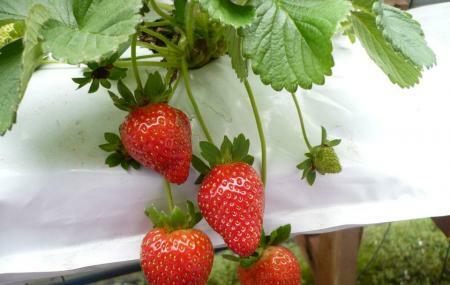 You will also be guided as to which strawberries to pick depending upon their size and colour. Why wait? Collect your favourite strawberries as well as various products such as jam and ice cream made from them. How popular is Yz Strawberry Farm? People normally club together Church Of Our Lady Of Mount Carmel and Tan's Camellia Garden while planning their visit to Yz Strawberry Farm. You can pluck strawberries while having breakfast. I love the scones here. Very soft & tasty. Great environment,very comfortable. Good place to relax & enjoying a cup of tea served with scorne, homemade strawberry jam. They have various meal and the ones I had and I found delicious was its scone and strawberry smoothie. The smoothie has authentic strawberry and yogurt taste. Another menu I tried was patin tempoyak. Very spicy and the gravy is flavourful. Served hot in claypot. Some of the meal will need you to wait, but not for long.